Just as the Earth's surface occasionally rifts right beneath our feet, the surface of the Moon also goes through periodic shakes and quakes. But, while the action itself may be similar, there are some weird contrasts. In response to reading about these odd 12th-century moon observations, commenter iCowboy wrote up this helpful primer about moonquakes. Also included: a note on why a moonquake can be followed by reverberations lasting up to 10 minutes — which NASA notes is in pretty stark contrast to what geologists observe on Earth, where earthquakes usually tap at after just under 2 minutes. 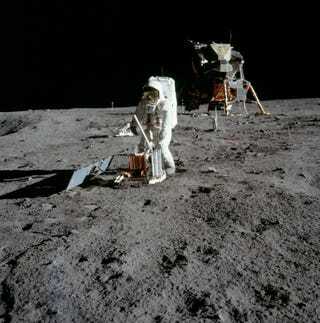 NASA studied moonquakes using seismometers placed by Apollos 12 and 14 onwards. The best results were obtained when the spent Saturn IV-B stages were deliberately smashed into the Moon since their precise mass, speed and time of impact were known, it was possible to see how earthquakes passed through the lunar interior. Sadly, they were turned off for budgetary reasons in 1977. From the cases that NASA observed, the Moon 'rings' for a comparatively long time after an earthquake or impact - up to about 10 minutes . Which means that it has to be mostly cold and extremely rigid. This explains why the Moon is largely aseismic compared to the Earth - it lacks a major heat source. Detailed analysis of the results suggests there is a 700km or so rigid metal-rich core overlain by a lower Mantle which is either plastic or partially molten, above which the Moon is very solid. The seismometers picked distinctly different types of lunar quakes - impacts, very shallow, weak thermal 'quakes caused by the sudden change between daylight and sunlight, very deep tidal 'quakes triggered by stresses on the Moon as it orbits the Earth, and apparently random 'quakes at an intermediate depth. The tidal 'quakes are very deep - between 700 and 1000km below the surface, but they are comparatively weak. There are occasional, bigger (c. M5-6) 'quakes from about 20 to 100km which aren't periodic and whose cause is uncertain.